Proactive monitoring is the hallmark of successful modern businesses. The last thing you want is to find out about a critical issue from your customers, when it’s having a negative impact on revenue. Your log files are full of signals about your application’s behavior and performance, but it can be hard to separate the signal from the noise. Loggly alerting gives you the ability to specify an exact set of conditions when you want the alert to fire, with all of the capabilities of our search function at your disposal. For example, you might want to be alerted if an error with some “normal” occurrence level spikes above that level or if a variable exceeds some threshold. One of the huge advantages of Loggly alerts is that you can define much more precise conditions than you can with most monitoring solutions. You could have a specific Java exception trigger an alert that goes directly to your development team or even to the subject matter expert for that particular part of the code. This can dramatically bring down time to resolution. Sometimes, it’s critical to keep your alerts coming, no matter how many times a condition occurs in a given period. But sometimes, one alert is enough. You may have started finding and fixing a problem, and new alerts about the same issue just add distraction. There may also be times when you don’t want any alerts at all. For example, one of your services may have a planned maintenance period for which you have already put workarounds in place or notified customers. Once your suppression rule expires, Loggly turns the alert back on so that you catch any future problems. When something is going wrong, it’s not enough to know that something is happening. You need to be ready to do something about it right away, and your teams need to be able to exchange information and communicate efficiently. That’s why smart businesses use a plethora of incident management, escalation, and collaboration tools. Loggly alerts fit seamlessly into these existing workflows. We now offer point-and-click integrations with Atlassian’s HipChat, PagerDuty, Slack, and VictorOps. If you don’t use one of these systems, it’s easy to configure Loggly to connect to any endpoint via HTTP/S. Just specify your URL and whether you want a POST or GET request. 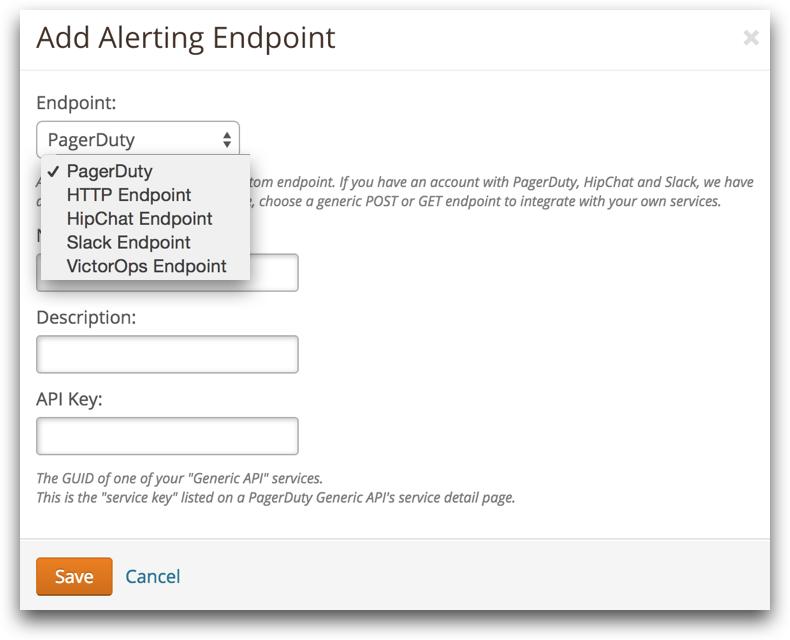 Adding alert endpoints is as easy as point-and-click. 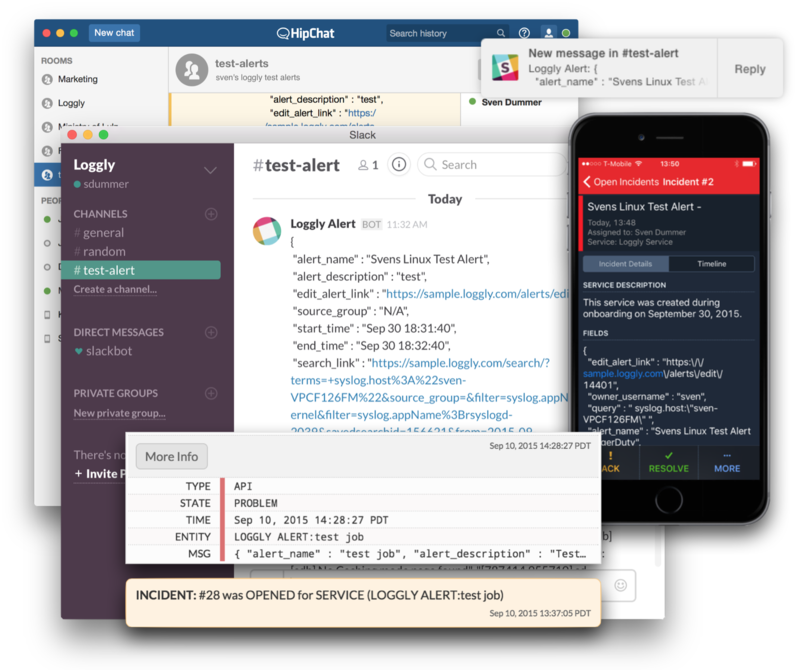 Loggly allows you to send alerts based on log events to a variety of messaging and collaboration tools, such as HipChat, Slack, Pagerduty, or VictorOps. With Loggly, you see log-related alerts in the environments where you’re already working. In addition, you can cut out “noise” from alerts that you’re already addressing. All of this takes just a few minutes to set up and adds up to faster responses to painful operational issues. Like all of our premium features, alerts are available as part of a Loggly free trial. So if you haven’t started one, now is the time!